Endoscopes are used to observe areas in the body that are otherwise unobservable due to inaccessibility. Medical applications include gastro endoscopy, which allows a doctor to view the inside lining of the throat, the stomach and parts of the intestine, whereas industrial applications include inspection in aerospace engineering. An endoscope typically has a transparent lens at its distal end to allow the image in view to be transmitted to the user. Currently this lens and its housing are produced in separate injection moulding processes and must then be attached to using costly micro-assembly techniques. A team of University researchers have designed and manufactured a mould tool that uses micro two-shot injection moulding, so that the transparent endoscopy lens is moulded as the first step and an opaque housing is moulded around it as the second step. The advantage in using multi-material injection moulding to produce the distal end of the endoscope is that parts are manufactured in a single step as opposed to using several steps to manufacture and assemble the different sub-parts. This reduces the production costs and production time. It ensures a strong bond between the materials, which also improves product performance and integrity in the field. 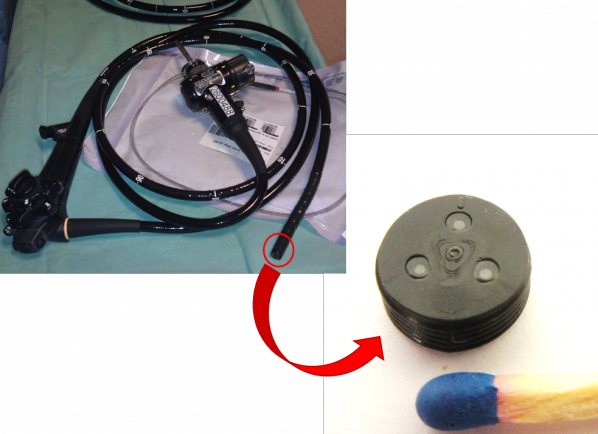 An example device was created for use in endoscopes, therefore, it is relevant to the manufacturers of endoscope parts as well as to clinicians who are interested in an improved design solution. However, the expertise developed in multi-material injection moulding can be applied to any market in which existing plastic parts are currently moulded and contain more than one material, ranging from toys to electronics. The distal end of an endoscope has been prototyped. A design covering the distal end of an endoscope was registered in April 2016 with European Community Design reference number 003040799-0001. The team has developed extensive know-how in simulating fluid plastic behaviour during the multi-material injection moulding process and is able to use this to troubleshoot existing processes of develop new ones. We are looking for commercial partners interested specifically in licensing the design for the endoscope lens assembly. In addition we are interested in development work with companies which could benefit from multi-material injection moulding to improve product quality and/or manufacturing processes. An e-learning course, consisting of four lectures on topics related to injection moulding is currently being offered by the University of Malta. The course is not intended for university students but for novice and experienced tool makers, tool designers, plastic part designers and other relevant stakeholders in industry. For more information click here. A half-day seminar on multi-material micro injection moulding was held on the Thursday 22 October 2015 at MCST premises in Kalkara - the seminar was addressed by a number of speakers, who treated various aspects related to high-value added manufacturing, micro fabrication and the EX-MMIM project in general.